Today’s economy demands a skilled, trained, and educated workforce and completing post-secondary degree or certificate programs has become a prerequisite for an increasing number of occupations. In fact, research from the Center for Education and the Workforce at Georgetown University projected that by 2018, nearly two-thirds of all jobs in the United States will require some type of postsecondary education. Culinary students have many options to consider when choosing the right culinary school and program. Whether their interests lie in restaurant management, food preparation, or other specializations, it is vital that they enroll in a program that offers their desired area of study and will help them excel in the field. 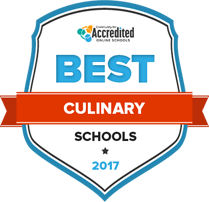 Through extensive analysis, we have served-up the best on-campus and online culinary programs and ranked them based on our criteria. Learn more about the best culinary schools and programs for 2017 here. Although many chefs are able to gain success in the field by learning as they go in the kitchen for many years, culinary schools give students a solid foundation of how to work in the field through a combination of practical experience and textbook theory. Culinary degree programs can be found at trade schools and community colleges, as well as four-year colleges and universities. Prospective students should evaluate their needs and ultimate career goals in order to choose which level of education–and type of school–is best for them. The following search tool can help you find both. Students who want to concentrate on an area of the culinary field can find topics to specialize in, giving them the expertise they need to get a specific type of position. Explore the culinary degree and program options below to learn about the education and training required. Cooks and chefs must procure and maintain fresh ingredients, create and refine menu items, monitor portion sizes, supervise kitchen staff and prepare food alongside other kitchen staff. Students in this specialization focus specifically on perfecting the art of making breads, pastries, and desserts, from conception to execution. Restaurant managers train staff, perform daily accounting and oversee the front of the house. They have a “whatever it takes” attitude. From the front desk to housekeeping to the kitchen, hotel managers must be able to effectively run all of the operations, not just the ones related to food. This specialization gives students the managerial tools they need to do that and more in just about any tourism and lodging setting. What people have to drink when they’re eating a meal is a crucial part of the experience. 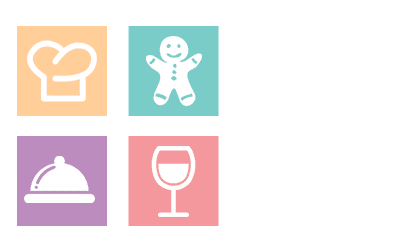 In this specialization, students explore how to pair the right beverages with meals, as well as winemaking, distillation and brewing. I strive to be the best I can each day. My culinary philosophy: I believe that food is so much more than just nutrition and fuel for our bodies. It can alter a person’s attitude and affect their entire day. I believe that if a guest comes in and is having a bad day, I can turn it around for them with great food and amazing service. That's my goal every time I have a guest walk through my door; everyone leaves with a smile on their face. How did you become interested in working as a chef? I grew up always seeing my mom, dad and grandmothers in the kitchen. I had always enjoyed working in the kitchen, but I never thought about it as a career until one day after school in the 11th grade. My friends and I were hanging out at my house after school. Everyone was hungry, but nobody wanted to leave the house to get food. I threw something together in the kitchen and everybody said they enjoyed it. I never thought I could use cooking to earn money until after everyone finished, they threw money down on the table. And then it clicked in my mind... I can earn money cooking! How did you choose the culinary school you attended? I chose the California Culinary Academy, Le Cordon Blue. I made this decision after looking at several schools and talking with my culinary instructor in high school. Factors that landed my with the decision were: The school was one of the top in the country, it was far enough from my home that I was on my own but close enough that I could go home regularly and for a reasonable price. What was the best part of culinary school? The two best parts about the CCA were the knowledgeable instructors and the unlimited access we (the students) had to ingredients. We were encouraged to use what we needed and or wanted. If there was an ingredient that we wanted to learn to use, but the school didn't have, the instructor would put in an order and we would have it in a day or two. What was the most challenging part of culinary school? Hands down, the most challenging part of the CCA was that you only got what you put in (this goes for many schools and most of life). Many students fell victim to this; they felt like they weren't getting their money’s worth out of the school, so they dropped out, or they dropped out because they simply didn't care about school and they preferred to be out partying. But for the students that did their schoolwork, read threw the books and engaged in class, culinary school was a very positive experience. I spent my free time working at the school, both as a T.A. and as a cook at their top restaurant (effectively doubling my learning time). How did culinary school prepare you for your career? Many people (myself included, to an extent) thought that by going to culinary school, we just automatically got top chef jobs right out of culinary school. Well...not so much. But what culinary school actually did for me (and what I believe it is designed to do) is give the students a solid base in the culinary field. We weren't walking out the door as young Thomas Kellers, but we were leaving with the skills and knowledge to get our foot in the door, impress them with what we already knew and quickly learn and pickup what other Kitchens were doing. On top of the recipes and techniques I learned, I had a basic understanding of how to run a restaurant and how to open a restaurant, and I was able to look at a PNL statement and discern enough information not to embarrass myself and to produce a PNL if called upon. What advice would you give to someone who is aspiring to become a chef? Working in a kitchen often involves long hours, low pay, harsh working conditions and little praise. You only get what you put into it, so read all the cook books you can get your hands on, constantly research different cuisines, travel and take every opportunity you can get to go and work in different kitchens and network. Networking will quite possibly help make or break you later in your career. It’s important to have a wide varied culinary network including suppliers, cooks, dishwashers, front of house members and managers.